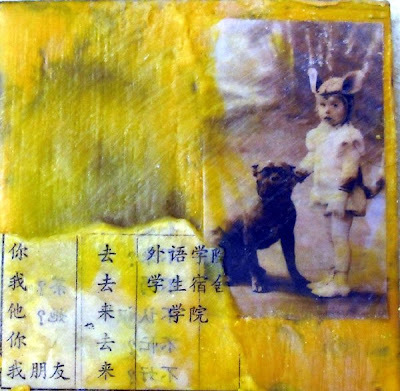 In preparation for today's encaustic workshop, I put together a few samples recently. Above I was fiddling around with glazes and layers. 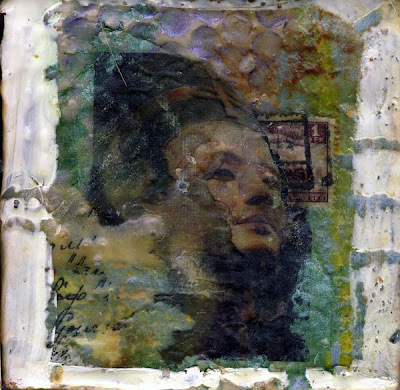 Below, I took an older piece that I had really liked until something happened to damage it--I can't even remember what it was, but I couldn't repair it. 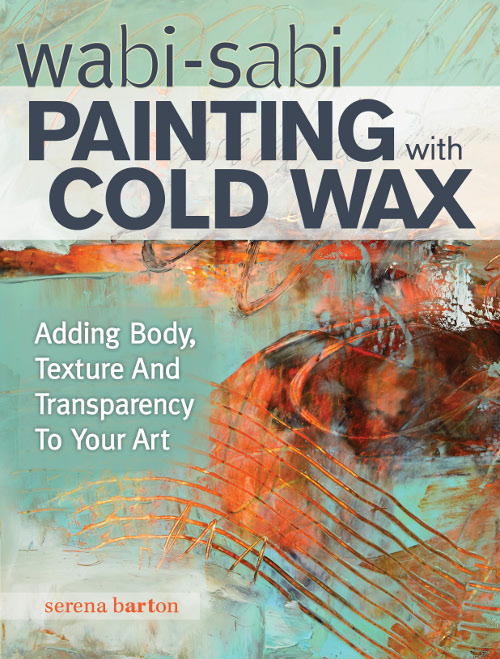 So I just had some fun playing with reworking the wax--I must have been hungry! 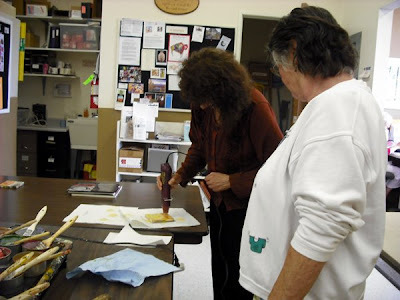 Here are some pictures from today's "Mind Your Own Beeswax" workshop at Village Gallery of Arts. This was my first time teaching there and I was very pleased with the space. We had lots of room to move around. 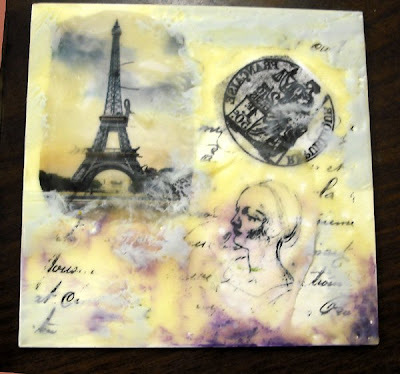 The students were all experienced artists and took to encaustic like bees to wax. Cindy experiments with using some mesh as a stencil. It worked great. This is the beginning of one of Cindy's pieces. She added the used teabag at the right to tone down the photograph. You can see the effect made by the stencil in the upper left. Here's a picture of the finished piece. I'm afraid the photo is a little blurry. Cindy's piece above was one of the first bits of serendipity today. 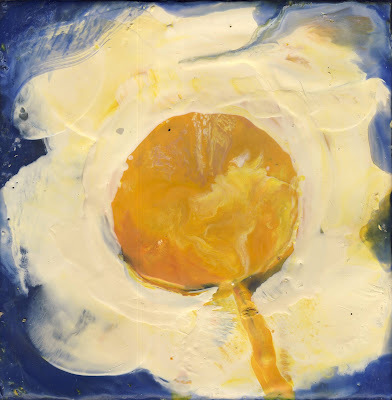 I was immediately reminded of artist Jasper John's famous encaustic flags of the 50's. 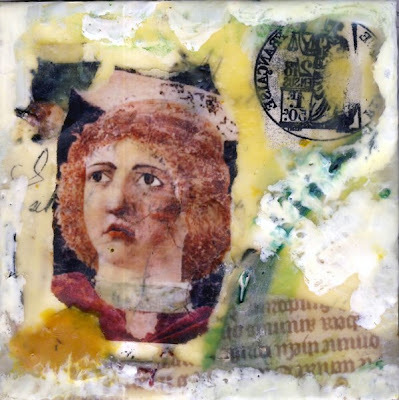 Johns was one of the first modern painters to bring encaustic techniques back from obscurity. Cindy said she was just thinking of Memorial Day--that works too! A deceptively simple piece by Jennifer. There is a lot of shadow and depth in the background and there seems to be a mysterious story here. 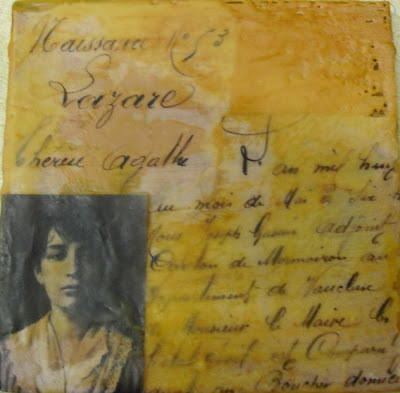 Jeanne, an experienced oil painter, brought some unfinished work to transform with encaustic. This has the shimmering quality of an Impressionist painting. A rich Italian-looking piece by Corina. 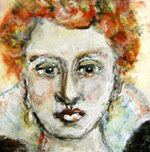 She added transparent oil paint as a finishing touch. 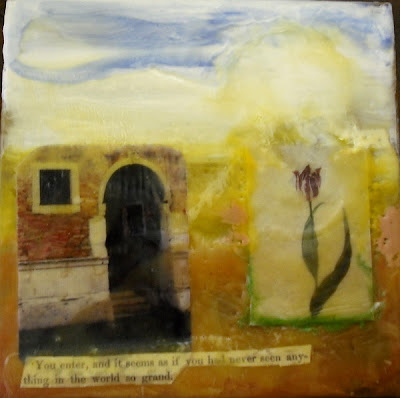 Corina made this humorous and cheerful piece for her yellow bathroom. 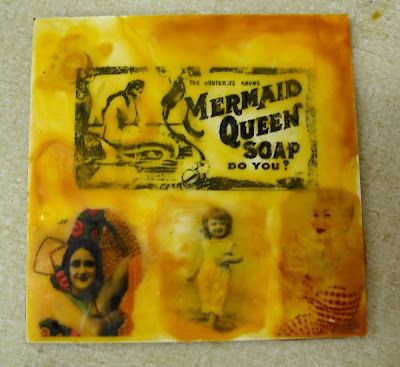 The Mermaid Soap label is a laser copy transfer (done with nail polish remover) on Claybord which is done before the encaustic is added. 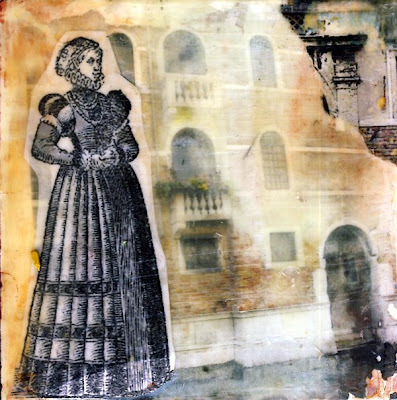 This is a demo I did with a laser copy transfer, and collage elements. I borrowed Cindy's stencil for the top of of my piece. 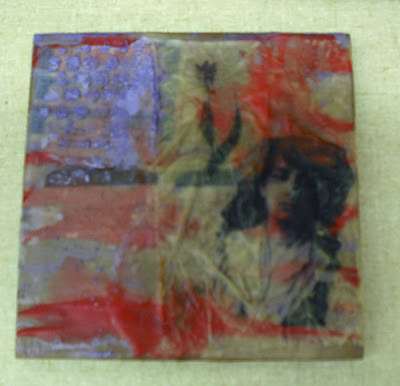 I added a vintage postage stamp and incised lines at the edges. 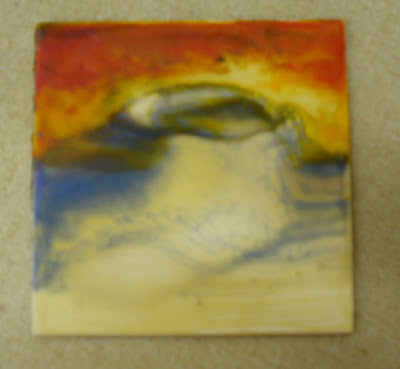 Encaustic can be difficult to photograph, especially in artificial light when you're in a hurry! Everyone was excited about the piece above, and I wish I had gotten a better photo. 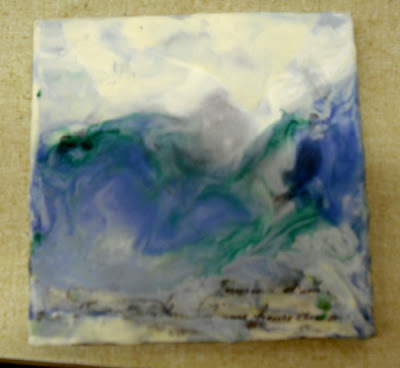 Jennifer achieved the great flowing effects by experimenting with the heat gun. Another incident of serendipity came when Jennifer chose the image of the woman for the above. 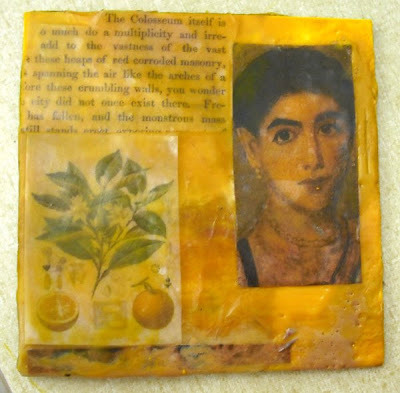 She didn't know the image was of an early Greek grave portrait--one of the first known uses of encaustic paint. Help--I can't remember who did this piece that reminds me of images on an Italian wall. 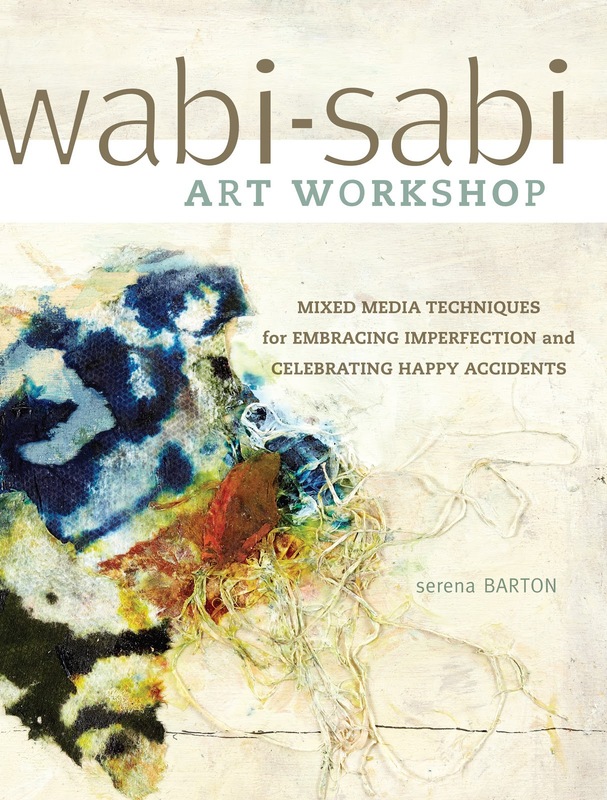 If you are reading this, dear artist, let me know! 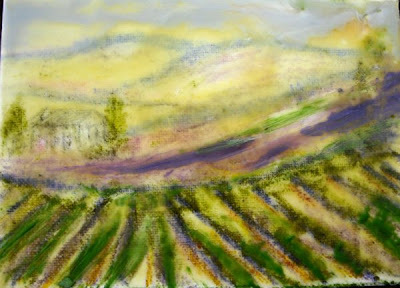 Jeanne transformed this glorious landscape with encaustic. It makes me think of the South of France at twilight--ahhhh. Cindy achieved this dramatic ocean-like scene by experimentation. Adding the white at the top really popped out the rest of the scene and made a strong contrast. This is one of my class experiments. 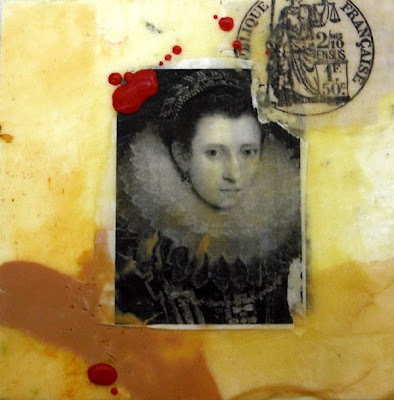 More serendipity occured when this collage image, which is purported to be Anne Boleyn was joined by the red paint, suggesting drops of blood. It wasn't my intention to add so much red, or to get this effect, but it fits! 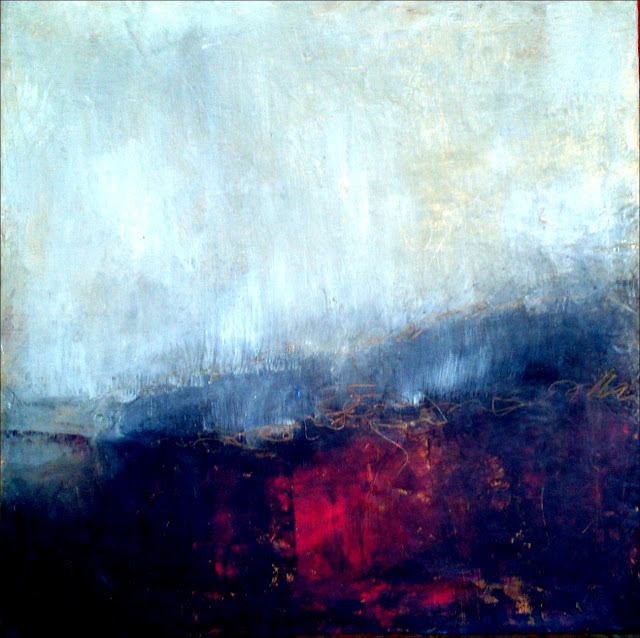 Jennifer's evocative piece. She didn't know the image was of French 19th century sculptor, Camille Claudel when she chose the French text to accompany it. 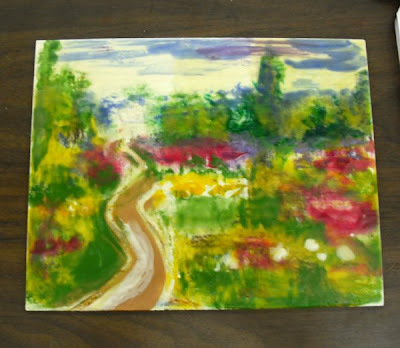 I used this "hodge-podge" experiment of mine to show how adding the white around the edges could save a piece. It's still a bit all over the place, but much improved. I think Corina is the creator of this lovely tribute to Paris. 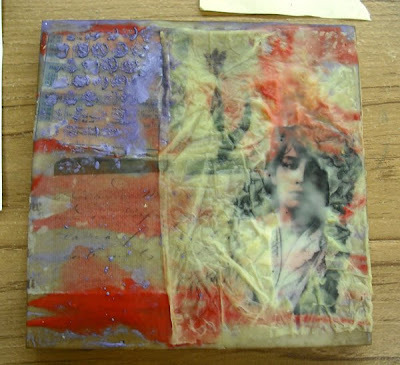 The piece has a laser transfer on the first layer and then paint and collage elements added on top. I finally finished an old experiment by adding oil paint on the left, the collage figure, and a small fragment of a photo at the top. 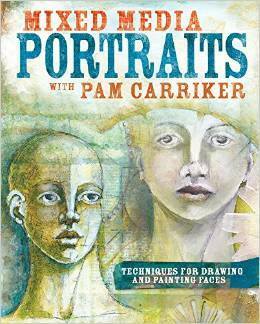 Cindy's spirals add unusual effects to the complex piece above. (Again, apologies for the blurry photo.) This piece has a haunting quality that draws the viewer in. 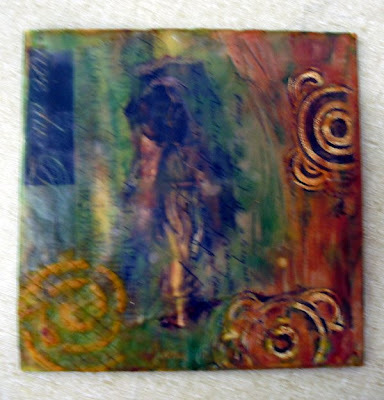 Cindy used fabric and a stencil for the spiral effects, drawn from a magic goody bag she brought with her. The vibrant painting above was actually the first completed. 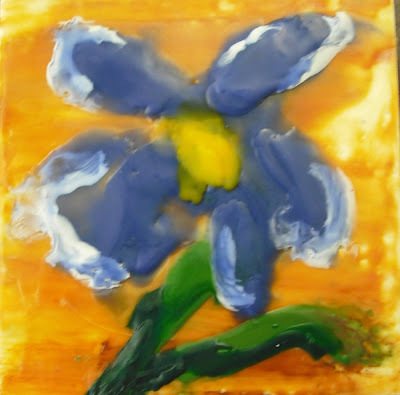 Jeanne's ambition is to do an entire painting of flowers in encaustic. I'm sure she'll succeed! Thanks to today's students for a wonderful day! 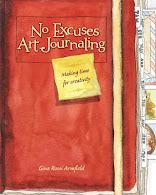 And now--announcing a Giveaway! Starting today, when you leave a comment on this blog your name will be entered into a giveaway contest. Two weeks from today, I'll put your names in a hat and draw out the name of the lucky winner. 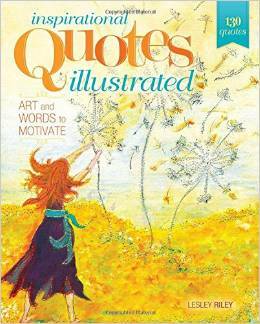 The winner will receive a copy of "True Vision" by L.K. Ludwig. (See link left.) If you already have a copy, I'll provide an alternative. What's not to like? So comment away and see what happens! I love these. How different and beautiful. Thanks! Let me know how to find you so I can enter your name for the giveaway! oops, I figured it out. My goodness, your work is fab-u-lous! I wish I could take one of your classes right now! Beautiful. I would also like to enter your contest. Serena, why are you bribing people to comment on your blog? You'll just get alot of snarky comments - like you should know that's not Anne Boleyn; that big ruffed collar didn't show up until close to 1600. Anyway, most of the artwork, yours and your students is great. That one by Jeanne is enough to to inspire me to do something almost realistic. The gel on the faux eucastic I did at Art & Soul finally dried - I think it took about 2 weeks - but I haven't yet put the finishing layer on it. It's good to hear from you. 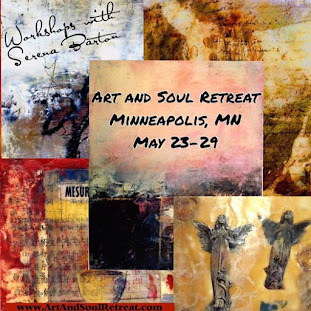 I enjoyed very much hanging out with you at Art and Soul. I stand corrected about the chance of the portrait being Anne Boleyn. I was going more by the face, but I'm sure you are right. Let's say the picture stands for Anne, smile. As far as bribing people, I think giveaways are quite usual and fun to do! You are hereby entered in the contest. Glad the gel finally dried--don't know why it took so long. Was that the self-leveling gel? 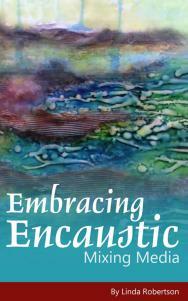 I have throughly enjoyed your Blog and seeing all the work by you and your students. I can relate better since taking your class. 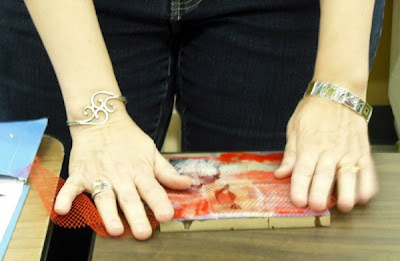 I'm inspired to try beeswax after seeing the results. 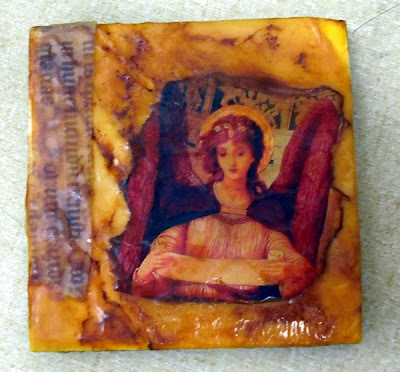 I'd love to see what you could do with beeswax! I bet it would be wonderful. I'm going to put some of your work up here as soon as I get the chance.